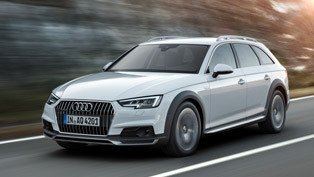 Sporty and superlative, progressive and emotive – the A4 takes Audi into a new dimension in the midsize car segment. 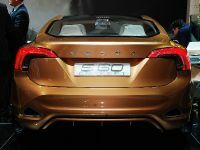 The two FSI direct injection gasoline engines provide supreme performance with fuel consumption that is more than 10 percent lower than the previous model. The highly efficient engines are clear evidence of Audi's outstanding technical expertise. 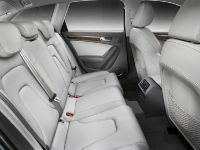 The dynamic suspension and many other technologies have been adopted directly from the large luxury class. 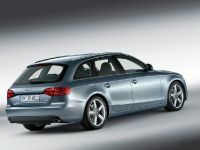 The Audi A4 reaches the U.S. market in Fall 2008. Compared to its predecessor, the designers tweaked the proportions into a new sporty ratio. The front overhang was shortened, and the hood and the wheelbase were extended visibly. The new A4 measures 4.70 meters (15.42 feet), nearly 12 centimeters (4.6 inches) more than its predecessor. 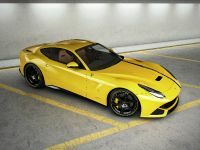 The body also documents the advances: It is significantly stiffer and safer than its predecessor, while, at the same time, dropping about 10 percent of its weight thanks to intelligent lightweight steel construction. 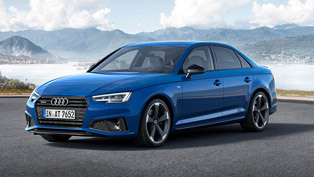 With a base size of 480 liters (16.95 cubic feet), and in the sedan 490 liters (17.30 cubic feet), the new Audi A4 has a larger trunk than any of its immediate competitors. 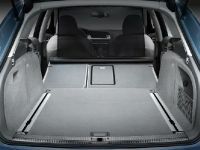 With the Avant, when the rear seat backs are folded down, the cargo space reaches up to 1,430 liters (50.50 cubic feet). The rear backrest is split at a ratio of 40:60, with an optional separate ski and snowboard bag. 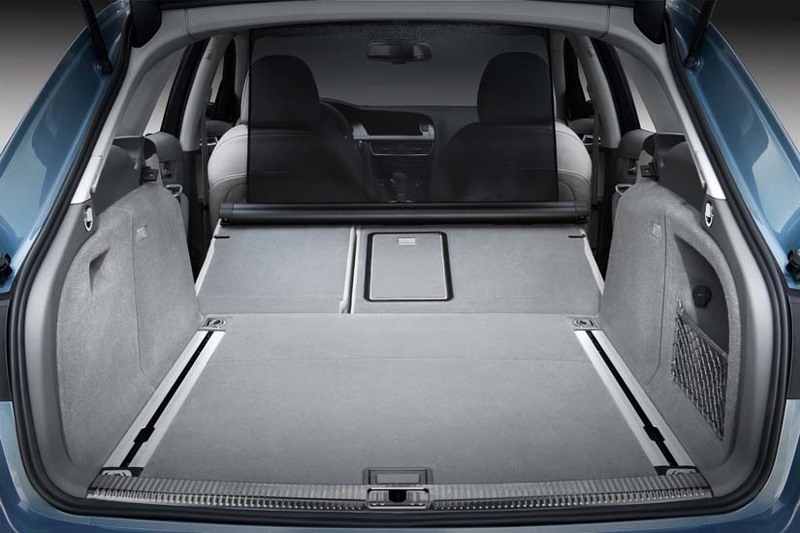 The A4 rolls off the line with sophisticated solutions such as a reversible cargo floor and a convenient cargo cover. Audi provides a number of optional luxury features, like an electro-mechanical tailgate drive and a luggage retainer set. The ambience inside the new A4 is light and spacious. Compared with its predecessor, knee room has been increased by 36 mm. 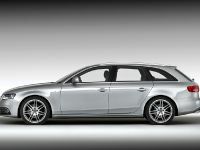 The same goes for the headroom of up to 971 millimeters (38.23 inches) in the Avant. The interior reflects Audi's traditional strengths – a noble impression, uncompromising quality of workmanship with attention to every detail, and logical, intuitive operation. The cockpit is driver-oriented, with the center console tilted by eight degrees to the left. In the design of a great many details, the A4 has taken cues from the larger A8. The instruments bear the classic Audi look, but with further developments. Thanks to the new electro-mechanical parking brake, the manual parking brake lever is no longer necessary. Even the standard climate control system is a completely redesigned component. It supplies 10 percent more cooling capacity, yet operates 20 percent more efficiently than the previous system. Slipping into the ergonomic perfection of the seats of the new A4 provides yet another typical Audi effect – you feel at home from the first moment on. Also, when it comes to safety, Audi has raised the bar: The adaptive airbags and twostage belt force limiters have been even more finely tuned, providing better protection for passengers. 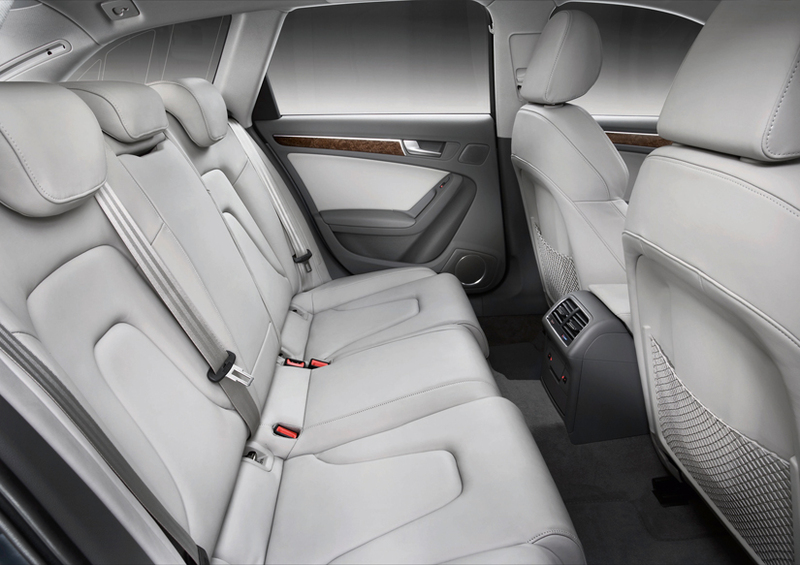 The backs of the front seats and the head restraints support the upper body in case of a rear impact. This integral headrest system has received high praise in independent tests. The new Audi A4 will be launched with two powerful and smooth-running gasoline engines, which cover a range of 211 hp to 265 hp. 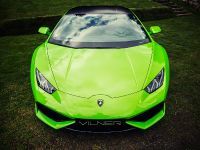 All the powerplants have direct fuel injection, and the four-cylinder gasoline engine utilizes turbocharger technology which provides high torque. The 2.0 TFSI is a new development, operating with the innovative Audi valvelift system (AVS), which varies the lift of the exhaust valves. 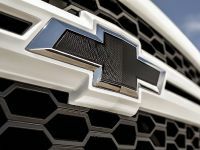 In a slightly different form, this technology also benefits the 3.2 FSI by providing a further performance increase combined with greater fuel efficiency. All in all, fuel consumption by the gasoline engines has dropped by more than 10 percent, a convincing testimony for Audi's efficiency strategy. Both gasoline FSI engines are available with the quattro permanent all-wheel drive, which is optional on 2.0 TFSI or standard on 3.2 FSI. Under normal driving conditions, this distributes the forces at a ratio of 40:60 between the front and rear axle. 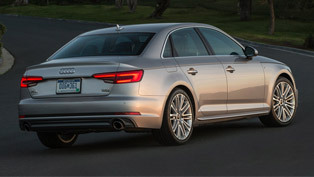 This emphasis on the rear end perfectly harmonizes with the overall dynamic character of the new A4. If needed, the self-locking center differential transfers the majority of the torque to the axle with the better traction. 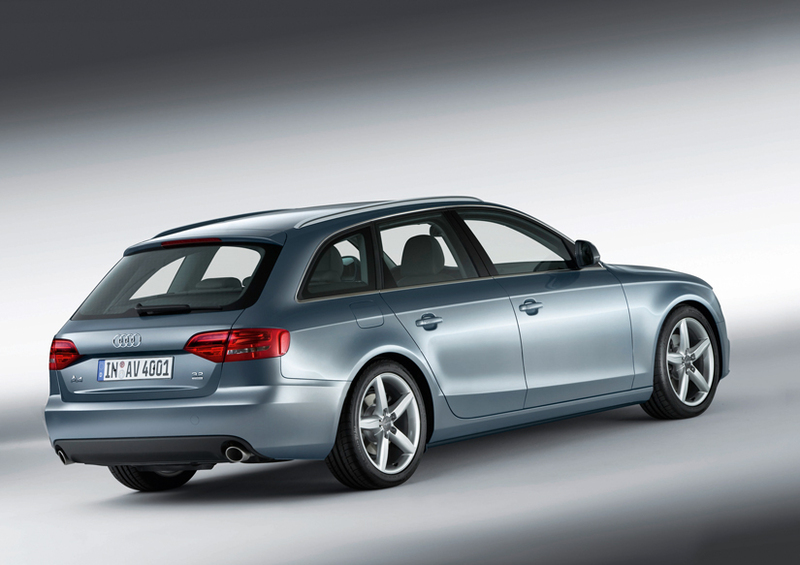 As in the past with all North American models, all A4 Avant models always have quattro as standard equipment. In the driveline of the new A4, the differential has moved directly behind the engine. 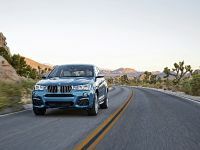 It has switched places with the clutch or the torque converter, making it possible to move the front axle 154 millimeters (6.06 inches) forward. This solution provides for a longer wheelbase, a shorter front overhang and a balanced distribution of the axle loads, thus improving handling in particular. 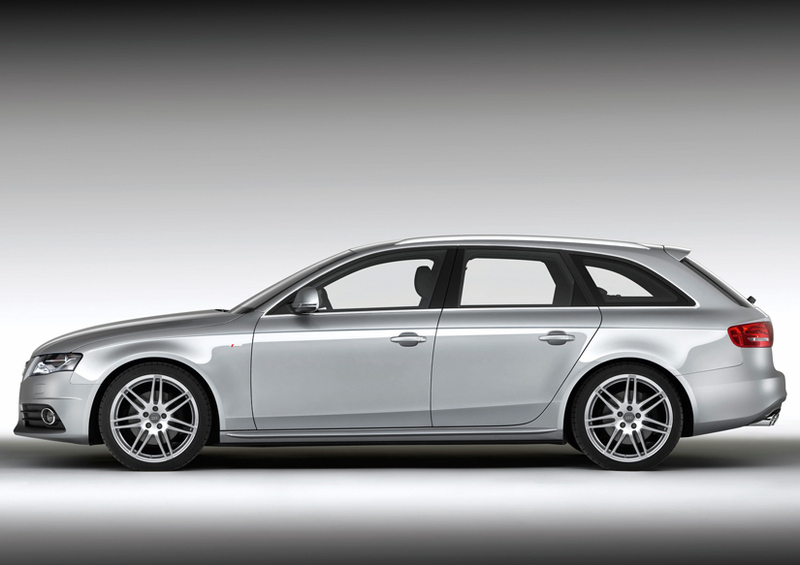 The dynamic suspension of the new Audi A4 was redesigned from top to bottom. The pivot bearings and the five links per wheel that make up the front axle are made of aluminum, just like the front cross member, which gives the front end of the body more rigidity. The steering box is located far to the front and deep down so that the steering impulse can be led directly to the wheels via the tie-rods. The rack-and-pinion steering provides an immediate feel for the road, and its highly efficient servo pump improves fuel consumption. For the rear axle, Audi applied the track-controlled trapezoidal link principle of the larger A6 and A8 series. For the most part, the suspension is made of aluminum; the separate layout of the springs and shock absorbers produces suztle responsiveness. Starting with the 211 hp engine, the new A4 will roll off the production line on 17-inch alloy wheels. Behind these wheels are powerful brakes; the front disks are ventilated. The electronic stabilization program (ESP) can be partially disabled when driving below 100 km/h (62.14 mph). In connection with Audi drive select, there are two additional modular components. One of them is an adaptive controller for the shock absorbers that is linked to a sports suspension which lowers the body by about 20 millimeters (0.79 inches). The second component is Audi dynamic steering, which operates using a superposition gear. Depending on the driving speed, it varies the steering ratio continuously. 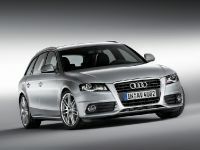 In the limit range, it works with ESP to stabilize the new A4 Avant with small lightning-quick steering interventions. 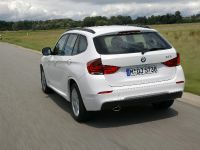 The system is also extremely useful when understeer occurs and when braking if traction is only available on one side. 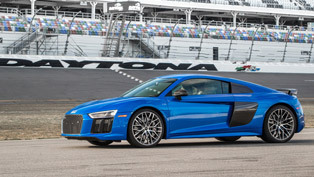 The leading-edge Audi dynamic steering system far surpasses solutions offered by the competition. Upon request, Audi equips the new A4 with a wide range of high-tech systems that are derived from the luxury class and make driving an even more supreme and relaxed experience. These include the Audi parking system and available rearview camera and the lane change assist system Audi side assist, which warns of hazardous lane changes. By way of automatic acceleration and deceleration, adaptive cruise control maintains the pre-selected speed, taking the distance to the vehicle in front into account. The Audi A4 also sets new standards in one of the most fascinating technical fields of the future – multimedia. The Audi Music Interface (AMI) is available for the audio systems concert and symphony and fully integrates an iPod with all its functions. 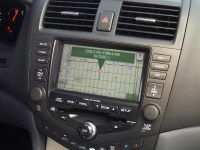 As additional upgrades, customers can order the navigation system with DVD and MMI. 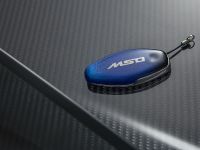 These allow the integration of a cell phone in the form of a Bluetooth car phone, and they are combined with the market-leading MMI operating system. The epitome of hi-fi enjoyment is the sound system by the luxury Danish brand Bang & Olufsen: 505 watts of sound power, controlled through 10 active channels, supplying 14 speakers.